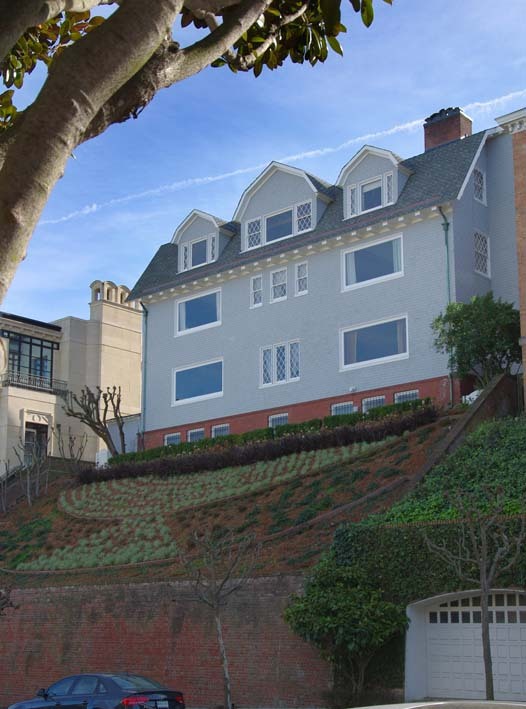 Built in 1907, this Pacific Heights view mansion is a classic piece of San Francisco architecture that has remained in the same family throughout its history. 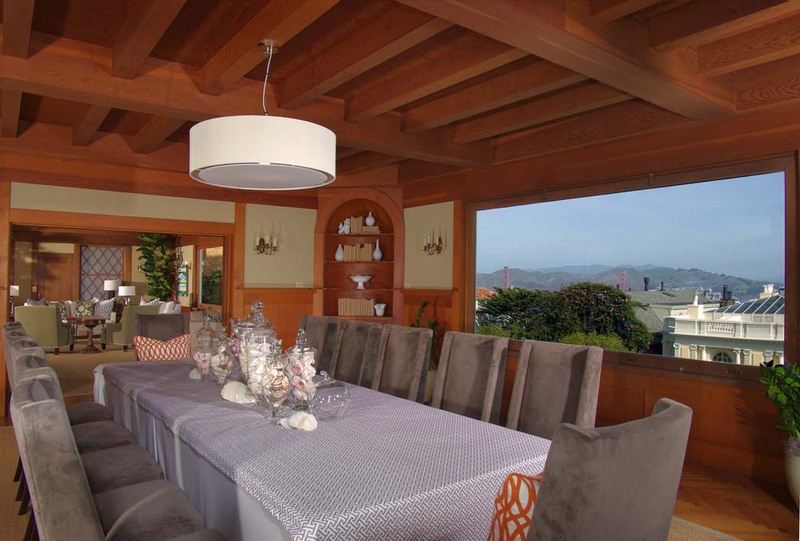 Set back from Pacific Avenue for the utmost in privacy, this grand residence is perched on the south side of the 2800 block of ‘Outer Broadway,’ one of only three blocks known as the ‘Gold Coast’ of San Francisco — where the most prestigious homes in all of The City take center stage with commanding presence. 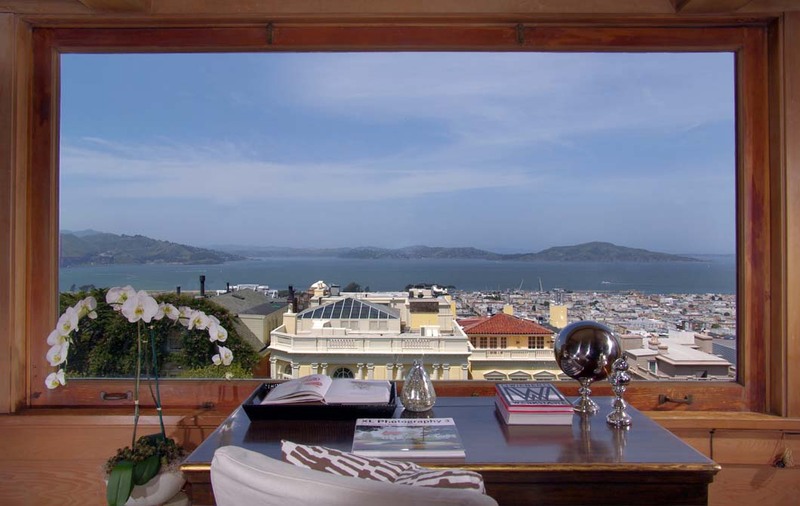 It is here, in this refined urban oasis, that a history of wealth and notoriety has been preserved for more than a century, paying homage to some of The City’s most notable families. 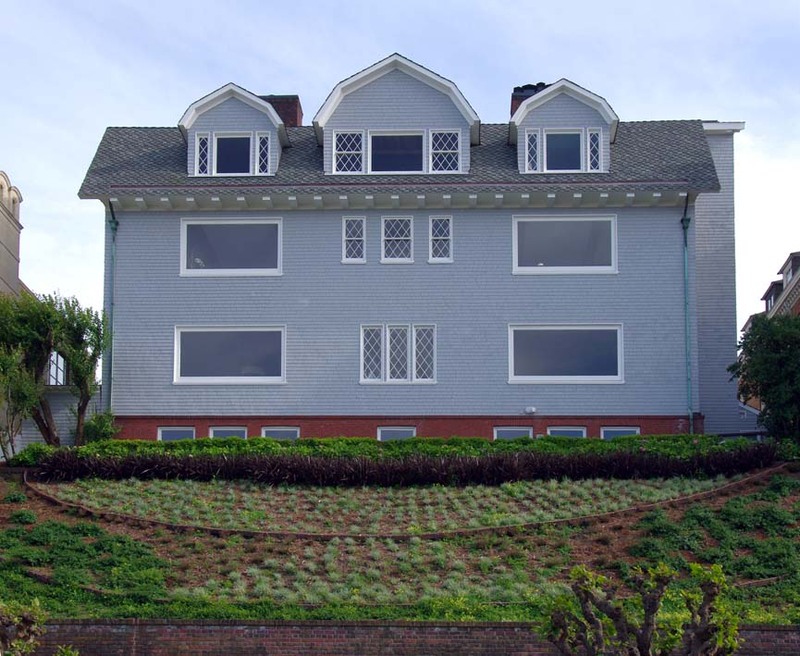 The residence at 2950 Pacific Avenue was originally owned by Edwin W. Newhall, who followed in his father’s footsteps running several spectacularly successful businesses, including an auction house, shipping and commission merchant business, an insurance agency, railroad, and ranches. 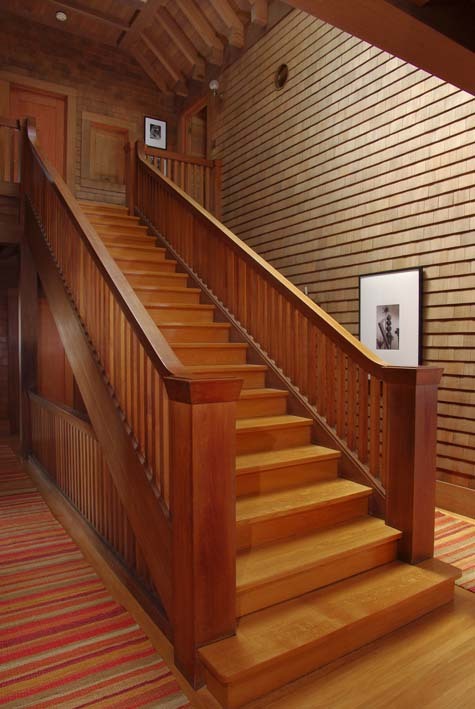 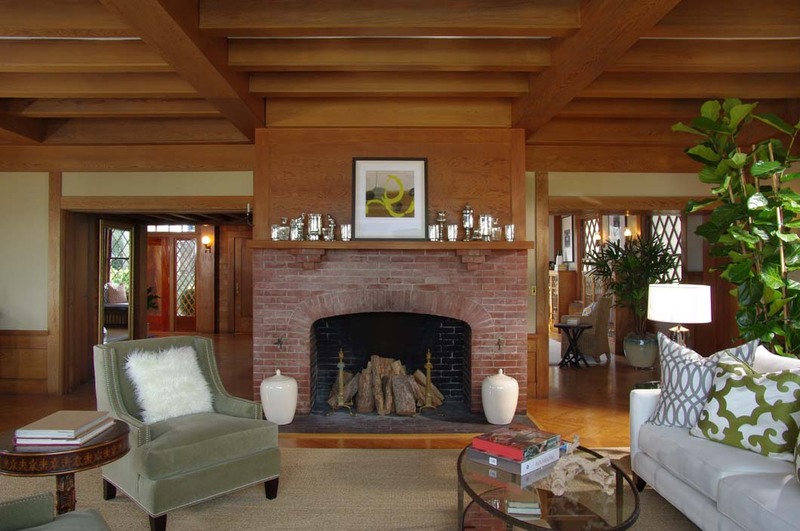 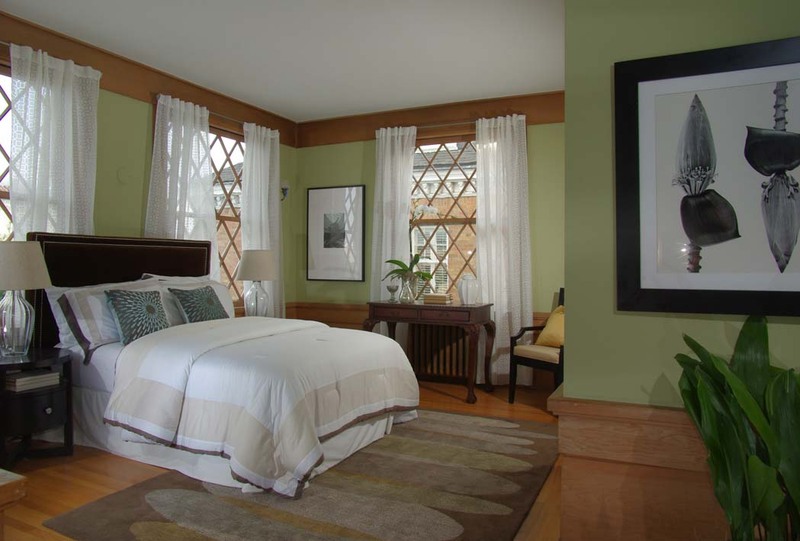 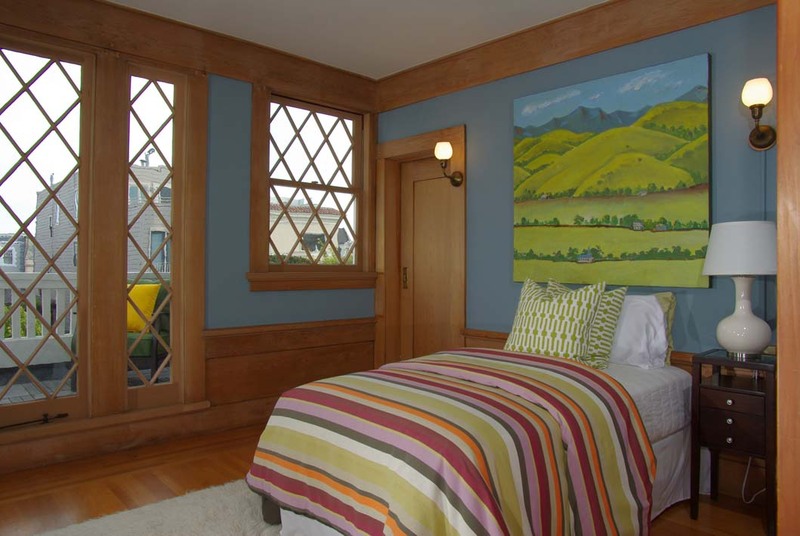 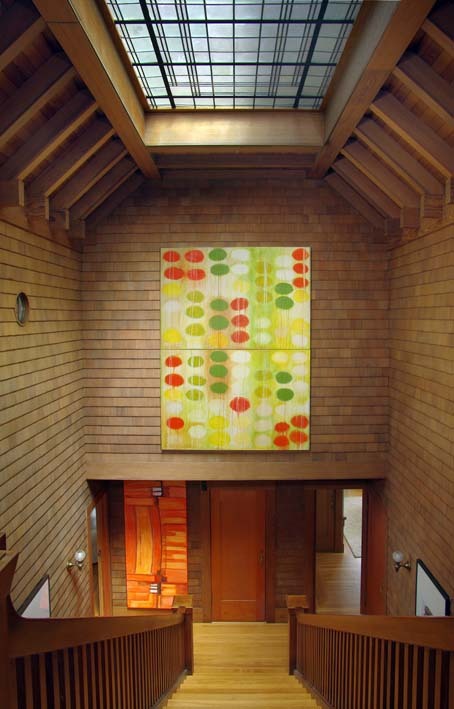 The architect for the home, Albert Farr, was renowned in San Francisco and the Bay Area. 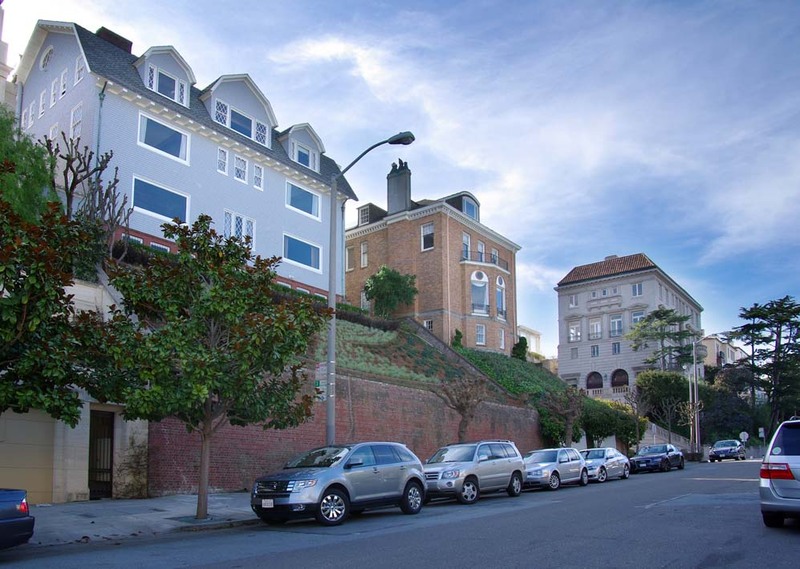 Farr designed houses in Pacific Heights and Presidio Heights including 3333 and 3334 Pacific Avenue both on the Presidio Wall and 2660 Scott, a stately Edwardian on the corner of Vallejo Street. 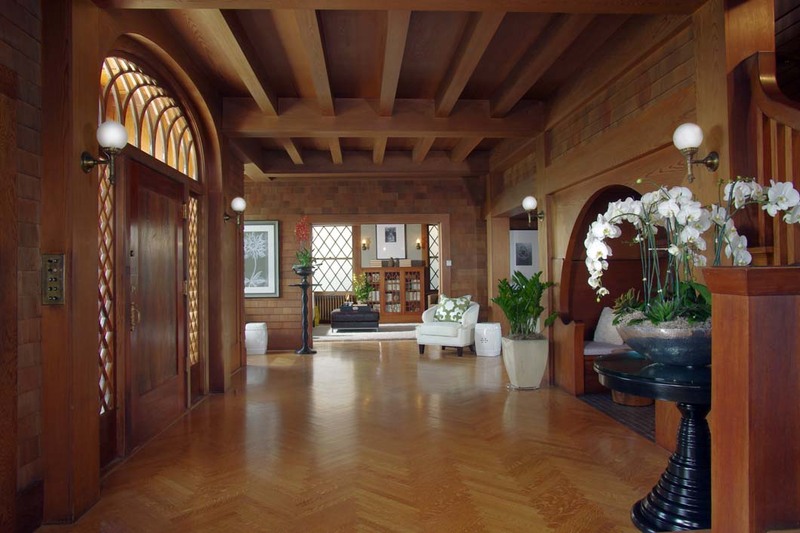 Farr also designed significant residences in Piedmont and Greater Bay Area, such as Jack London’s Wolf House and the Benbow Inn in Garberville. 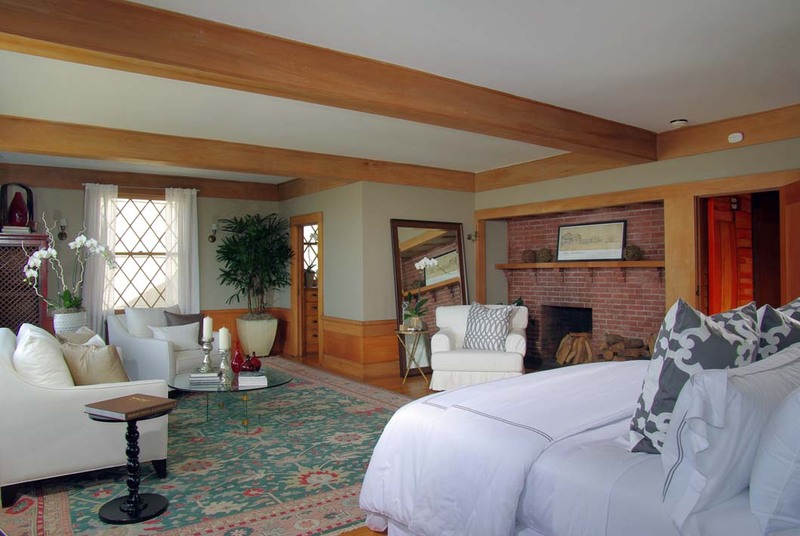 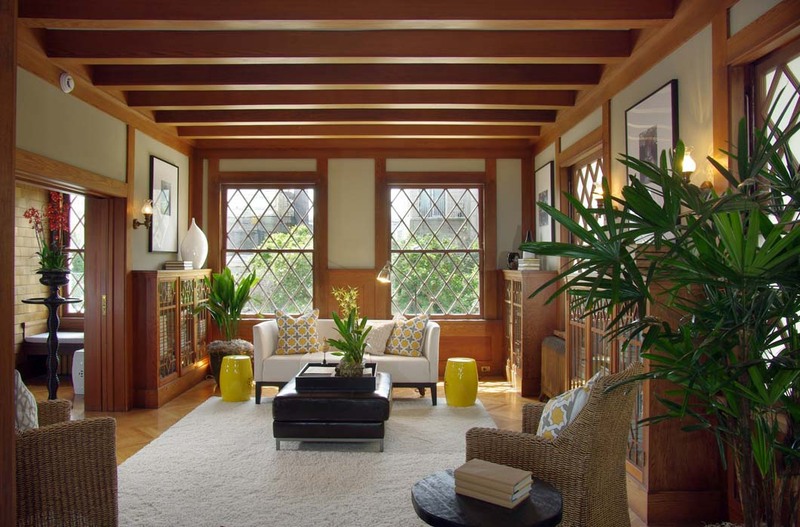 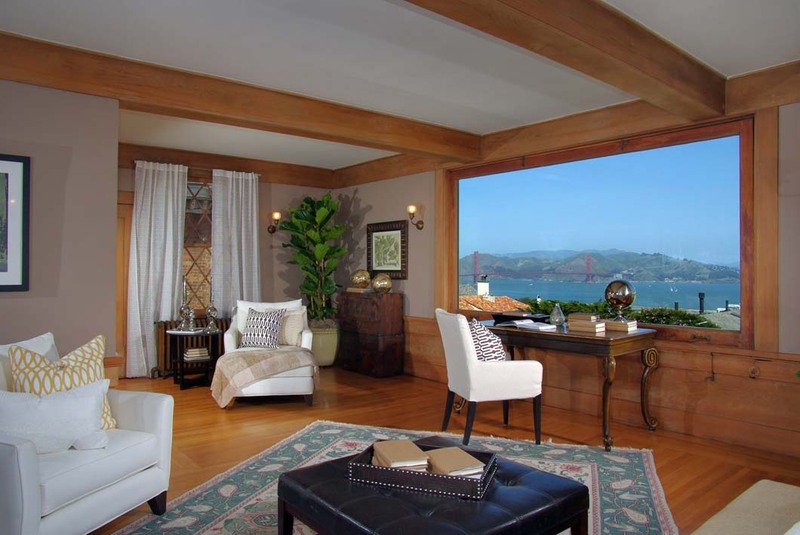 Today, the historic residence stands as it was — a classic example of Dutch Colonial Revival architecture with shingled facade, period lighting, and myriad diamond divided light windows, plus picture windows that present magnificent Golden Gate Bridge and Bay views. 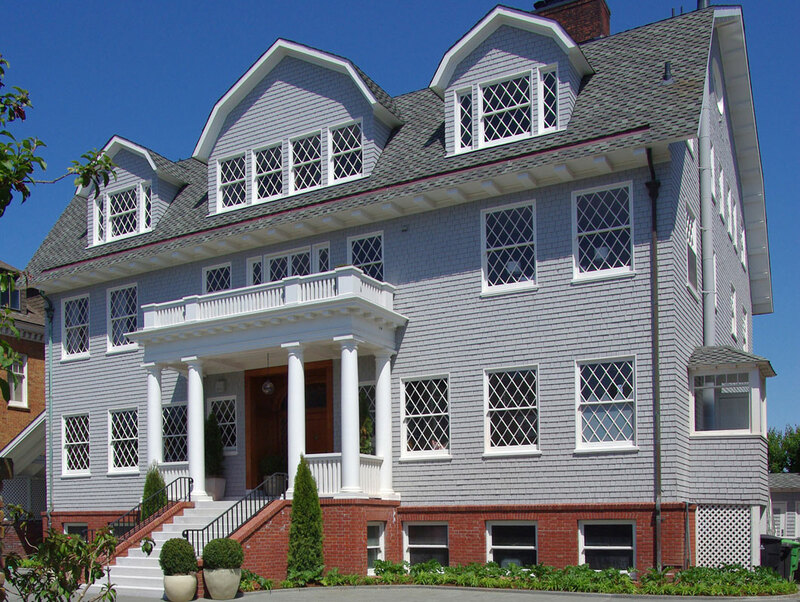 Spanning four levels plus a spacious attic, the home reflects the design of the early 1900s, with grand formal rooms on the main level, a continuous succession of family bedrooms and sitting rooms on the second and third floor, plus original staff quarters and the main kitchen on the basement level. 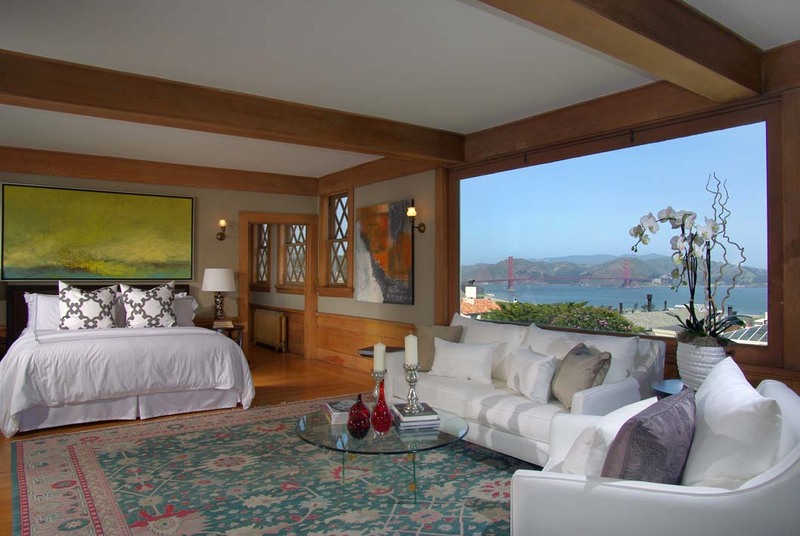 With over 15 main rooms and approximately 11,500 square feet (per floor plan designer), the home presents a remarkable opportunity to reimagine the interior design for a variety of 21st century lifestyle needs. 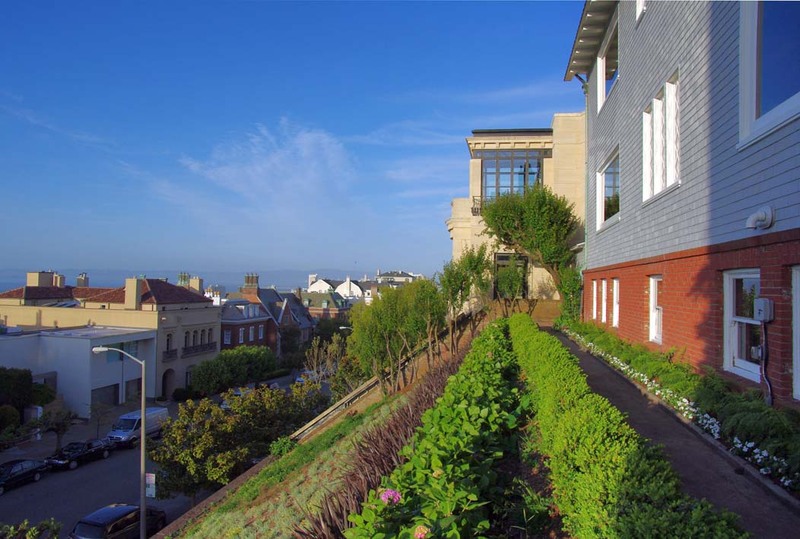 Topping it all off is a magnificent lot of approximately 14,000 square feet, with south-facing landscaped motorcourt (accessed from the private driveway on Pacific Avenue) and north-facing (sloping) garden with brick perimeter wall fronting on Broadway, both of which are almost 90 feet wide. 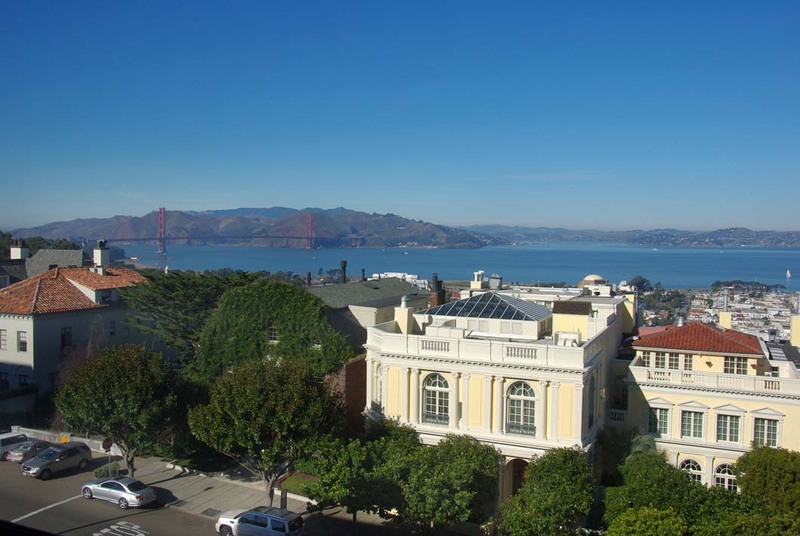 Beyond the privacy afforded from its secluded location, the pulse of The City is ever apparent in close proximity with a sense of energy, diversity, and excitement that only urban living can provide. 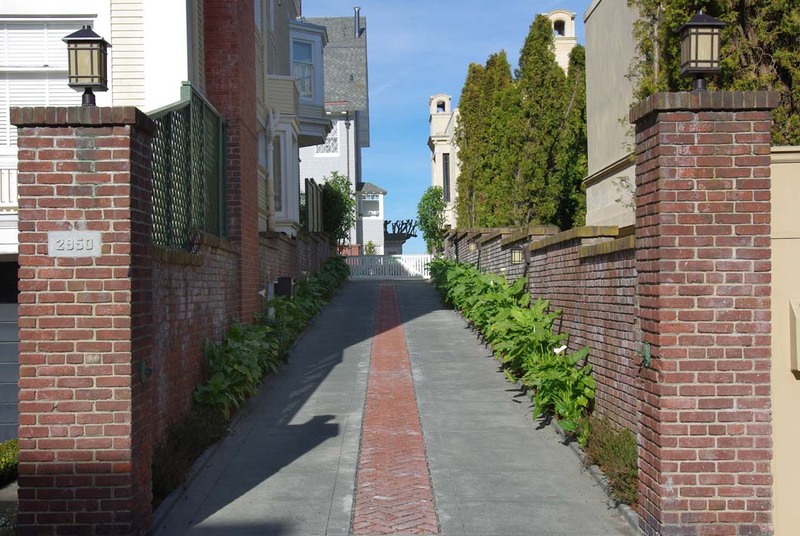 Exceptional culinary experiences, boutique shopping, parks for tennis and play, and a tapestry of sidewalks for jogging and dog walking are all in the neighborhood — a property that is truly a rare treasure for many generations yet to come. 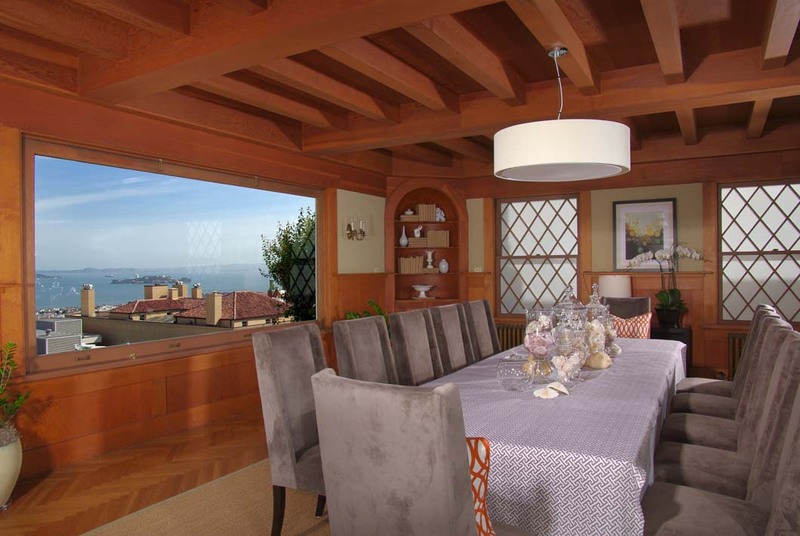 This level features a wonderfully unique nautically inspired family room known as the “ship room” that reflects the Newhall Family’s yachting background; this handsome fully paneled room has matching window seats, built-in bookshelves, and twin porthole windows. 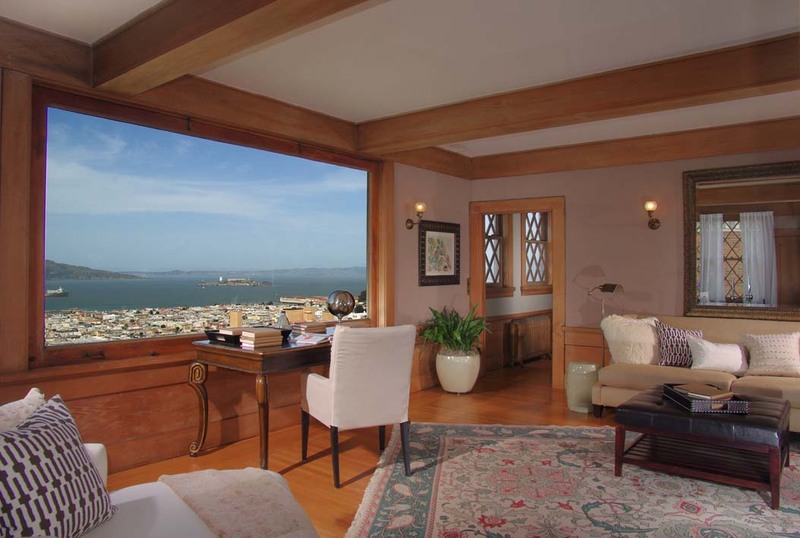 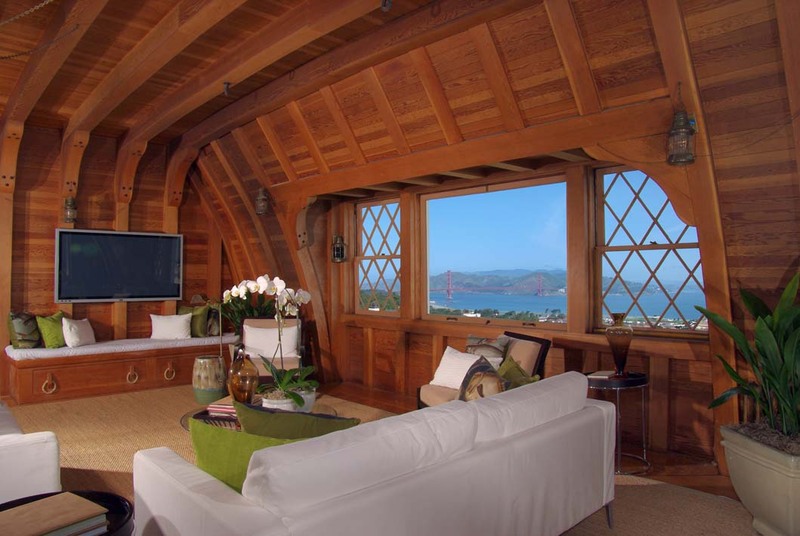 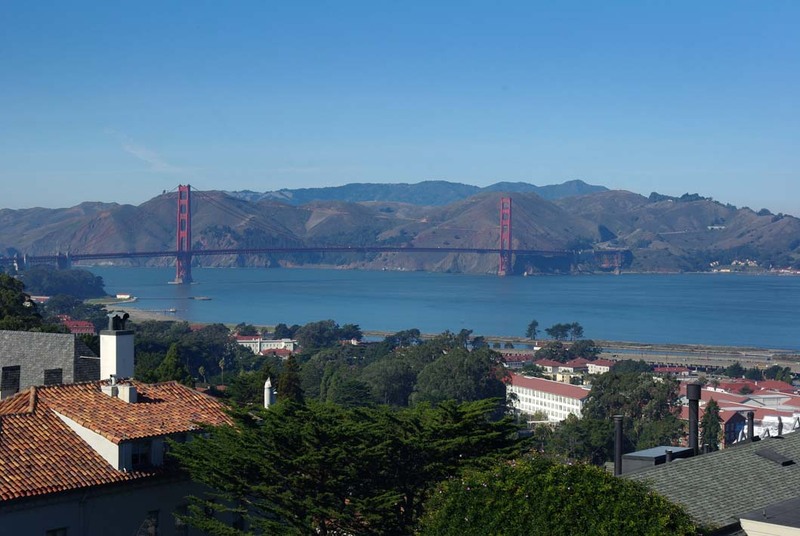 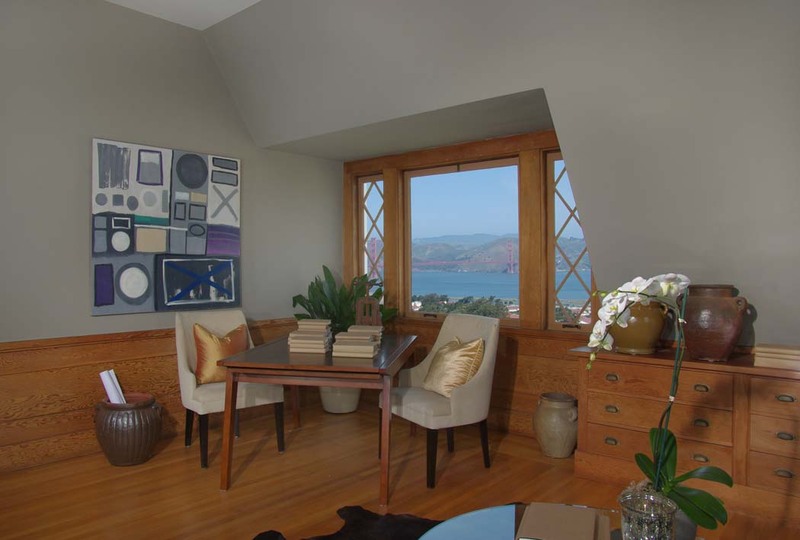 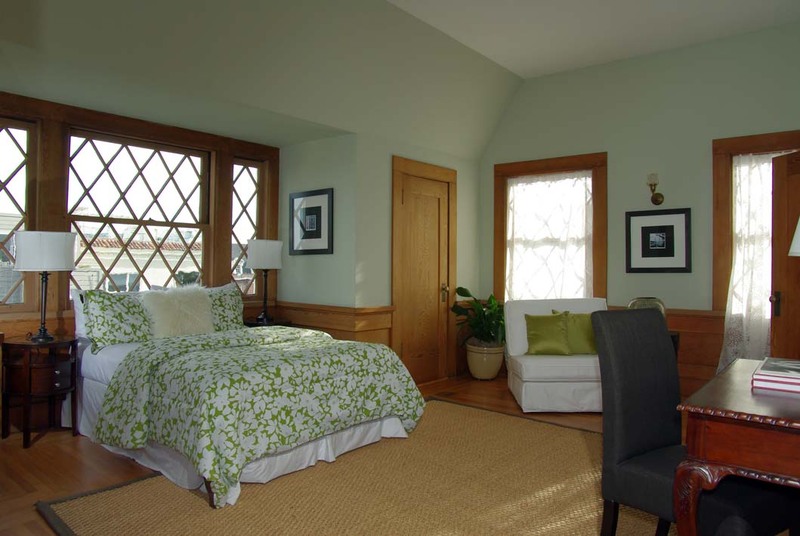 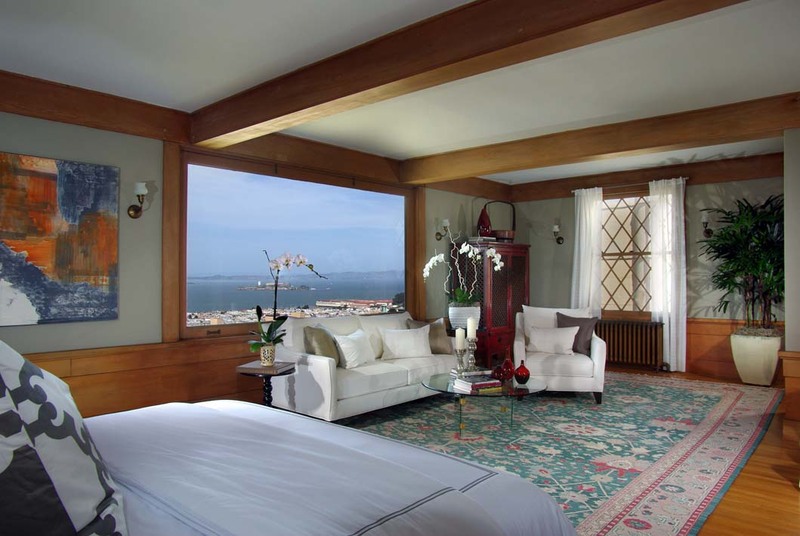 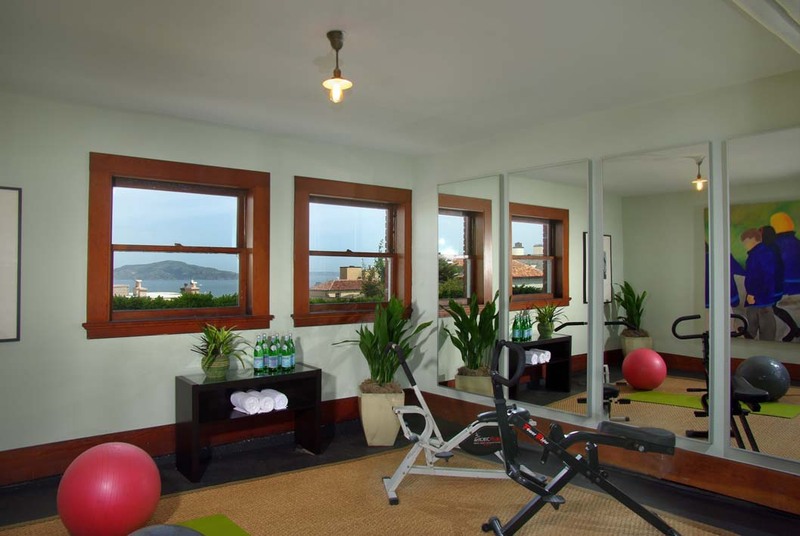 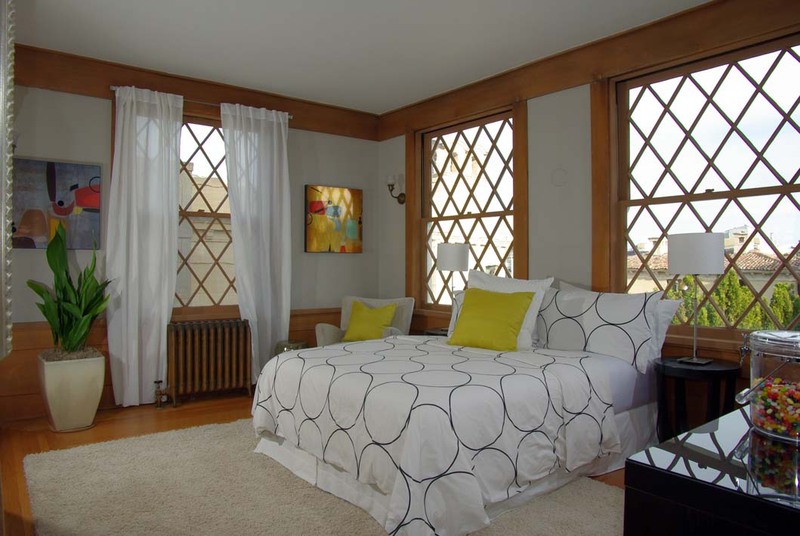 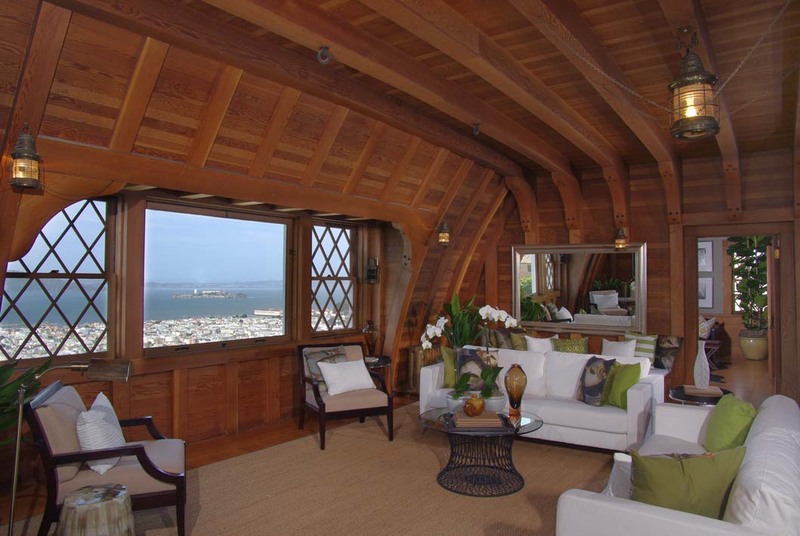 Two additional north-facing rooms — an office/sitting room and a bedroom with elevator, flank the ship room and all three have amazing Golden Gate Bridge, Bay, and city views. 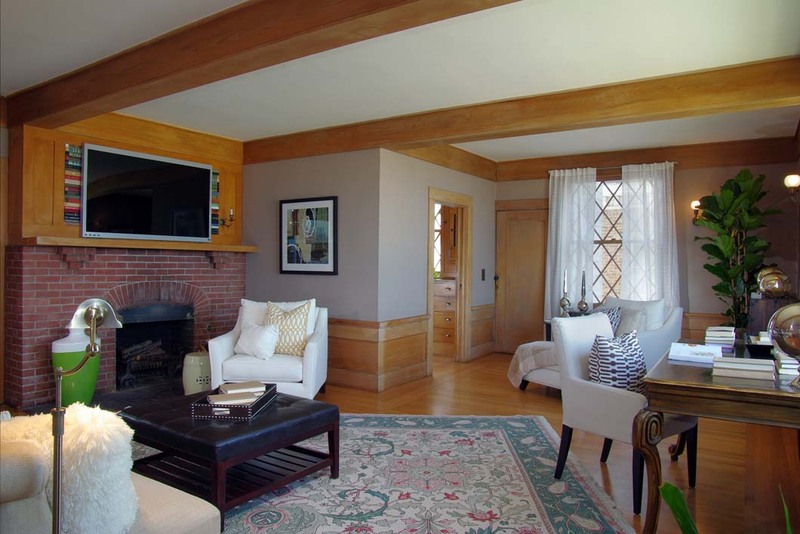 Two additional bedrooms, three original staff bedrooms, a small kitchen, two full baths, and a half-bath complete this level. 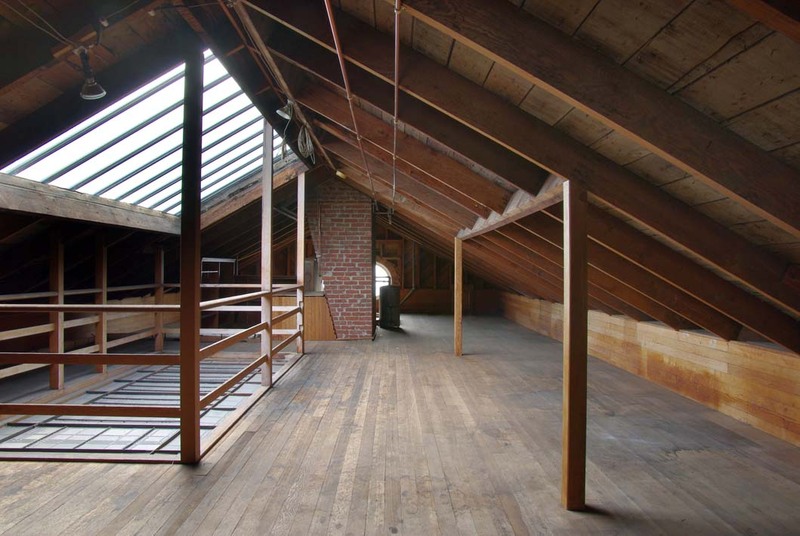 Service staff and cooks were originally housed on the basement level, which is comprised of a sizable kitchen with original iron stove, pantry, and an ample preparation space; also included is a wine storage room, large laundry room with conventional washer/dryer hookups plus original gas-fired commercial dryer, a potting/flower arranging room with adjacent outside access, boiler room, storage room, exercise room, and three small original staff rooms. 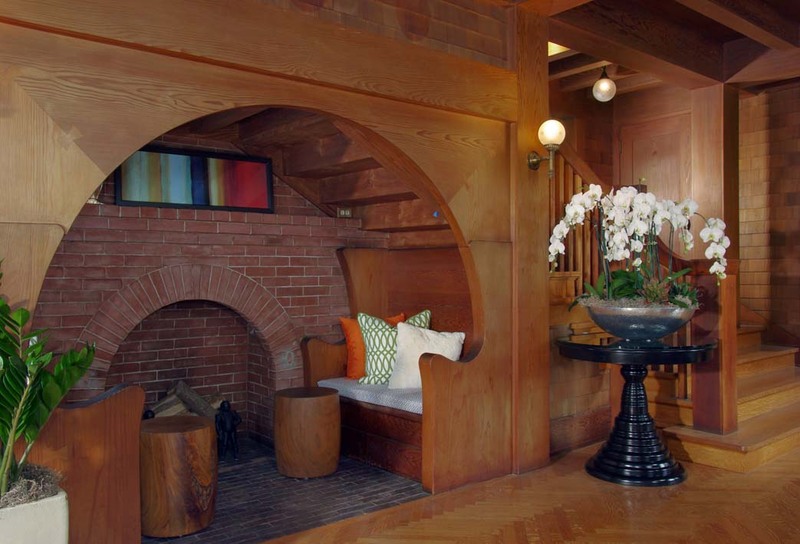 A split bath completes this level. 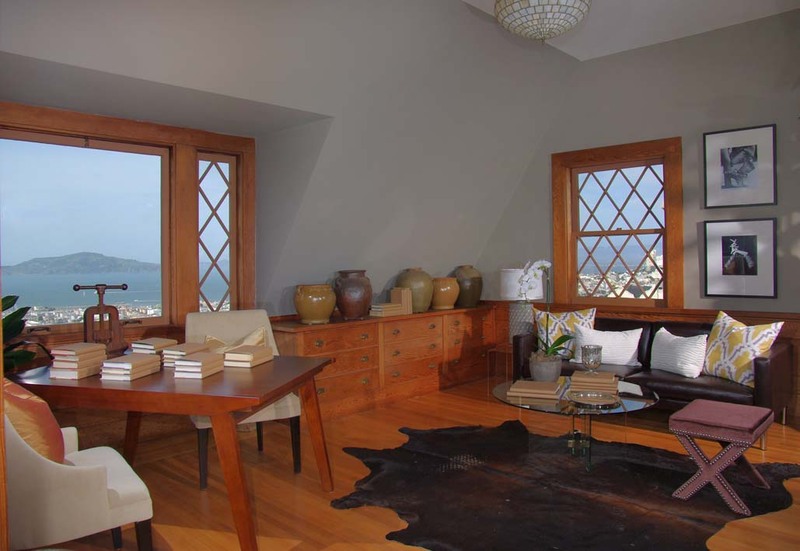 Interior access from main floor, good ceiling height and bay views from north facing windows contribute to the functionality and potential of this floor.